This command guide is to support the Nixie Tube Driver, from Doayee. The library was written by Thomas Cousins and falls under the GNU Lesser General Public License; as such it is free to use, adapt, redistribute, hack, stick on a billboard, complain about, or contribute to. For any help or queries please email: thom @ doayee dot co dot uk. This guide is for the version 2 library. If you are running the version 1 library the documentation can be found here. We strongly recommend, however, that you upgrade to the new library for all the latest features. If your circuit has both analogue and digital ground, connect to the digital ground to avoid adding switching noise to the analogue ground. SRB - Strobe output. Connect to micro-controller for strobe control (strobe turns all elements of all tubes on the driver ON), or leave unconnected. OE - Output Enable. Connect to micro-controller for blanking features, or tie to +5V (with a max resistance of 1k) if unused. CLK - Clock. Connect to micro-controller. DIN - Data In. Connect to micro-controller. Note: The RGB cathodes will not function correctly with the library on all pins. Refer to the list below for which pins are safe to use. These are all RGB cathodes, to vary the intensity of a colour a PWM signal should be applied to these lines. The lower the value of the duty cycle, the brighter the LED of that colour. HV - High Voltage Input. Connect to nixie tube power supply. +5V - 5V Supply input. DO NOT touch or alter the connections to your driver when it is powered or has recently been powered. HIGH VOLTAGE CAN KILL. Below are the electrical characteristics for the Nixie Tube Driver, product may not work as specified outside of these regions. Whenever you are using the Nixie tube driver library, you must include it at the top of your sketch. This allows the IDE to recognise commands from the library. To begin using the library you must first define the class, in this case, ‘nixie’, but you could call it anything. The pins you are connecting to the Nixie tube driver with must be specified in the data and clock fields. The output_enable and strobe fields are optional connections, but we recommend connecting them to access the full functionality of the library. From now on all commands must start with your class name, then a dot. This links the command to the library, and without it the sketch will not be able to compile. 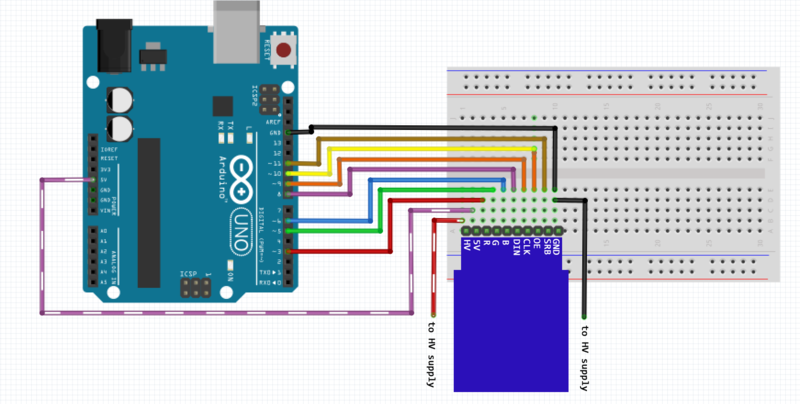 The display function is the most useful function of the library; it takes an input number, which takes an integer, a long integer, or a floating point number (see https://www.arduino.cc/en/Reference/HomePage for info on data types) and displays it on the tubes. For a floating point number, the decimal point position is calculated and implemented automatically, though this will require IN12B tubes to display. Clock mode is a convenient mode included with the library, which allows the display to be used quickly and easily as a clock or timer. The tubes will display all numbers in 3 groups of two, as shown: HH.MM.SS with a decimal point between each group. All inputs to this function are in integer form. nixie.setTime(13, 27, 00);    //Sets the time to 27 minutes past 1. This function takes a string in the form "HH:MM:SS" and uses it to updated the time. It is designed to be used with the compile time macro __TIME__ (See here for details on compile time macros). nixie.setTime("11:23:00");    //Sets the time to 23 minutes past 11. Updates the time physically displayed on the tubes to the current time held in memory. These commands allow the user to make use of the IN15A and IN15B tubes, which come with a variety of symbols for the user to implement. The symbols to the left are available, with their tube type and name specified. The nixie library includes a comprehensive backlight controller, which allows smooth blending of colours between fades, custom colour loops, and user controllable durations, all in the background of the sketch. The backlight controller functions as a completely independent sub-library, and therefore requires its own initialisation. To begin using the backlight controller you must first define a separate class, in this case, ‘rgb’, but you could call it anything. The pins you are connecting to the backlight LEDs with must be specified in the redPin, greenPin and bluePin segments. This function changes the colour of the backlight to whatever colour is specified, in the example it is yellow. Amounts of each colour can vary from 0 to 255. To use the colours included with the library already, simply write the name of a colour, preceded by your library object name (in our case 'rgb'). This function allows seamless blending of two colours, over a specified time. The colours must be predefined, or part of our included set. rgb.crossFade(rgb.red, rgb.blue, 1000);     //Fade from red to blue with a duration of 1s. This function fades a colour in from black over a specified time period. rgb.fadeIn(rgb.aqua, 3000);    //Fade in to aqua over 3s. This function fades a colour out to black over a specified time period. rgb.fadeOut(500);    //Fade out over half a second. The library has features that allow you to set up a colour fade, and start it cycling in the background of your code. To do this you need to set up the colour cycle first, before you begin the fade. The following format applies for setting up a cycle. First, you must make an integer array, of dimension [N+1], where N is the number of colours in your fade. You can then specify colours and their respective durations (note: this is the duration of the fade from one colour to the next, it will not remain on the specified colour for that time. Should you wish to remain on a single colour for a period of time you should put 2 of the same colour sequentially). Should you wish to specify your own colours you should do so using a definition, rather than a variable. This should be done at the top of your code, after #include <NixieDriver.h>. This does not need a type and this line should not end with a semi-colon. This will first fade from your current colour to the start colour, in the time specified, and then begin fading through the cycle specified in the background of the code. "My background colour fade returns FALSE and does not begin, why is this?" If this happens, it is likely your arduino does not have enough RAM to perform this fade. The memory required to perform the fade is dynamically assigned each time you start the fade and returned to the heap each time you end the fade, therefore if there is not enough available the function will abort and free any RAM it had successfully acquired. SOLUTION: Reduce the number of colours in your fade, or move to a larger Arduino (if you are running on an UNO, try a MEGA). This will stop the cycle wherever it currently is and fade it to the specified colour over the time period specified. rgb.stopFade(rgb.green, 3000);    //Stops the cycle and fades to green over 3s.